All major internet payment processors such as FDMS, Global Payments, Heartland, Paymentech, and TSYS are supported. 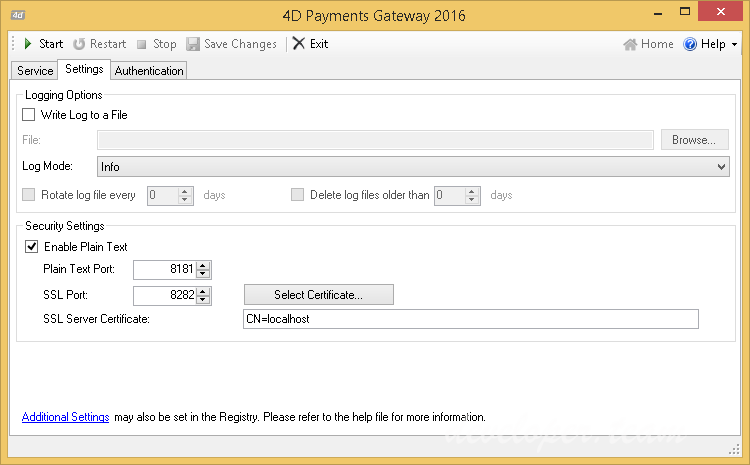 Familiar REST/JSON interface makes coding to the 4D Payments Gateway easy from any language. Flexible self-documenting APIs вЂ“ write a script and itвЂ™s automatically accessible via the web service. Our credit card transaction and electronic payment products are built to Payment Card Industry Data Security Standards which means that your applications will be built with the most up-to-date secure and compliant credit card processing components available. TodayвЂ™s broadband always-on Internet connections are vastly superior to dialup links, providing virtually instantaneous authorizations, error-free connections, and greater security. Certified support for FSA / Healthcare, Retail, Grocery, Restaurant, Hotel/Lodging, Auto Rental, Direct Marketing, E-Commerce, Debit, EBT, GiftCard, Level II, and Level III transactions*. PCI Security Standards Council PA-DSS validated. Bypass expensive gateway fees by working directly with an Internet payment processor. EMV transaction capabilities are now available through Paymentech, TSYS, and FDMS processors. Secure data encryption using up to 256-bit SSL encryption and Digital Certificates. Address Verification Service (AVS) data support. Card Verification Code (CVC) support. Support for commercial purchasing cards including Level II and Level III transactions. Support for Recurring and Installment payments. Credit Card validity checks decrease expenses that result from attempting to authorize invalid credit cards. Extensive documentation, sample applications, fully-integrated help, and much more! Speed up TSYS Authorization requests by sending interleaved transactions. The full-duplex communication mode, also referred to as “Interleaved Mode”, is intended for high volume transaction environments and allows for transmitting and receiving transaction data simultaneously without blocking.